HOT SULPHUR SPRINGS – A Grand County sheriff’s deputy shot and killed a man near the front door outside of the Riverside Hotel at 509 Grand Avenue in Hot Sulphur Springs Monday night around 11:50 p.m.
Grand County Sheriff Rod Johnson confirmed early Tuesday morning an unidentified “male victim” died in the shooting, but did not reveal any details about the individual. The deputy involved in the shooting suffered minor injuries. The wife of an unidentified Grand County sheriff’s deputy called in the incident to dispatch. Johnson would not say whether the shooting took place during the deputy’s line of duty. 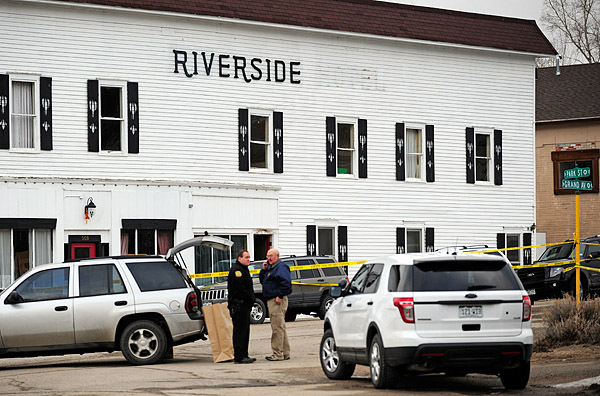 According to several people in the area, the Riverside Hotel, which was being used as a private residence, is owned by an officer who works for the Grand County Sheriff’s Office. Johnson referred further inquiries to the Colorado Bureau of Investigation, which arrived to the scene about 7:30 a.m. and would be providing updates as information becomes available. The Jefferson County District Attorney’s Office is overseeing the case, according to Johnson. The Hot Sulphur Springs Post Office, located across the street from the Riverside Hotel, was closed Tuesday morning as officials diverted traffic away from the taped-off crime scene. The covered body of the dead man was still lying on the sidewalk this morning in front of the Riverside near the hotel’s front entrance.